Early detection of hearing loss has resulted in much earlier diagnosis of hearing loss and provides the time amplification fitting at a young age. As important, early identification of hearing loss allows professionals to work with families to assist them in learning their important role supporting the communication development of their child. 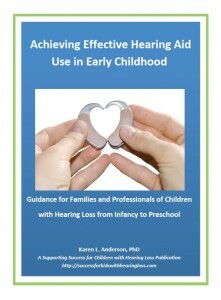 The following resources are for use by professionals as they discuss how to facilitate communication development with the families of infants and toddlers who have been identified with permanent hearing loss. Provision of well-fit HAs reduces risk and provides some degree of protection against language delay. Greater aided audibility is associated with better language outcomes in preschool. Early HA provision results in better early language outcomes, but later-fit children demonstrated accelerated growth patterns once aided. Qualitative dimensions of caregiver input influence child language outcomes. Children who are hard of hearing appear to be at particular risk for delays in structural aspects (i.e., form/syntax) of language. Sole reliance on norm-referenced scores may overestimate the outcomes of children who are hard of hearing. In summary, aided audibility, HA use, and characteristics of the language environment interact to moderate the influence of HL on children’s outcomes. Successful Outcomes Requires Commitment and Focus! Refer here for an example of a contract between the family and early service provider(s): Formula for Success Contract. Part C Early Intervention services require that functional outcomes be specified as part of developing the IFSP. Many people coming from a therapy background are challenged by developing outcomes that are functional, rather than therapeutic. Examples of Functional Outcomes for Early Intervention Services for Young Children with Hearing Loss was developed via a group discussion by early intervention providers serving families of children with hearing loss. 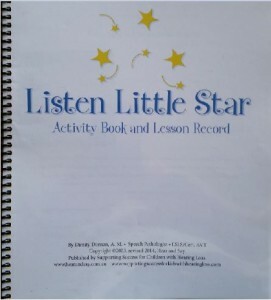 It is important to recognize this resource is not a menu to choose from, but rather a list to inspire IFSP teams as they think about how to address the unique needs of children who are deaf or hard of hearing. Included are guidelines for how to develop appropriate functional outcomes. Sometimes the model of early intervention means that the family will be served by someone who does not specialize in the early learning of children with hearing loss. This resource specifies why this is very important to the early (and lifelong) outcomes of the child. Even when the family receives services from a teacher of the deaf/hard of hearing, sometimes the services of a speech-language pathologist are denied – even if the family has made it clear that they want the child to learn to listen and speak. Why Your Young Child with Hearing Loss Needs Speech Services provides information on why it is important to insist that a speech language pathologist be an active part of the early intervention team, especially for families who want their child to listen and speak. 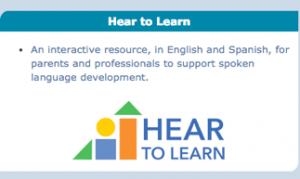 Hear to Learn Resource – a learning resource to help parents of young children support spoken language development. This online resource is free and it is available in English and Spanish. Content is developed to be easily accessible (e.g., short video tutorial segments that are narrated and captioned). Easy to follow language activities can be downloaded. Parents can share their story, ask questions, attend webinars, and read about relevant research. 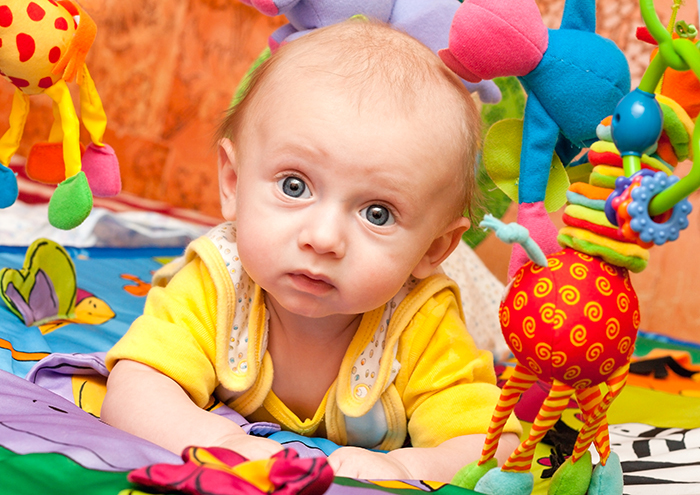 Research data was used to develop some very basic, evidence-based questions that early interventionists or audiologists can ask families of infants and toddlers to quickly determine if obvious delays are present. Not a replacement for actual speech and language measures, this one-page handout it easy and clear to use, providing a good place to start your discussions with families about the expressive abilities of their child. The Central Institute for the Deaf offers free resources for those willing to enter their name and email. Download Guidelines for the EI Professional, An entire chapter of the early intervention book, Small Talk, the Ling Sounds Check, Hearing Aid Checklist, and other resources. choices or continuum of communication modalities that may be used by children and their communication partners to develop language. This resource presents different aspects of communication as building blocks that can be combined and recombined based on the child’s learning style, desired mode of the family and changing communication situations. It is meant to introduce the concept of communication choices in an unbiased manner and emphasizes that any choice of communication modality can change as the child develops. THE RULES OF TALKING – parents can hang this single sheet of reminders on the refrigerator to help them remember ways they can encourage your young child to talk. Language Unlocks Learning This resource was developed to explain to families their unique and critical role in facilitating language development throughout their child’s waking hours. The article: Parent Involvement: The Magic Ingredient in Successful Child Outcomes (Hearing Review Nov 2002), provides similar information and refutes the perspective that a child only needs to have their hearing loss identified and wear hearing aids (sometimes) to learn what he or she needs to become an effective communicator. Actively involved families truly are the magic ingredient in successful learning outcomes. Parent Interview Progress Report It is very possible for a child whose hearing loss was identified early (1 month) and wears hearing aids consistently from an early age (by 2 months), with actively involved families, to be learning language at the same rate as their age peers. The Parent Interview Progress Report can be used by early intervention providers working with families to rate various activities that strongly influence the outcome of language development for children with hearing loss. It was written as a follow up to the Language Unlocks Learning handout and intended to be used as part of outcomes monitoring every 6 months, especially if a child has not gained 6 months of language development in that same period. Setting Reasonable Expectations About Hearing Aid Wear Attaining full-time hearing aid wear is a big challenge for many families of infants and toddlers with hearing loss. Having consistent sensory input at a young age is critical for developing the brain’s ability to process sound meaningfully. Recent information indicates that 40% of children use their devices less than 4 hours per day and that a typical young child (age 0-4 years)only has hearing aids on 5 hours per day with 2 hours of that spent listening in noise. Only about 10% of children ever achieve full time hearing aid wear (all waking hours). We recognize that use of functioning, well-fit amplification devices is the #1 most effective means of improving language outcomes in children with mild-severe degrees of hearing loss. This handout provides guidance to families on how to establish full-time hearing aid wear.